It's that day again....Monday...when it all starts over again! We had a good weekend...picked out our pumpkins and spent some quality time with some good friends. All in all, a great weekend! Today I am sharing another Pinterest recipe I found. It's a great, kid friendly recipe. And they are super easy to make! Pre-heat the oven to 375. Lightly mist 8 cups in a muffin tin with cooking spray and set aside. Heat chili oil (or Olive oil) in a saute pan or large skillet over medium-high heat, add the ground beef and taco seasoning and brown beef, breaking it with a spoon. Add black beans and continue to cook, stirring occasionally, for a few minutes until warm. Push a wonton wrapper into the bottom of each of the eight sprayed cups in the muffin tin. Spoon a teaspoon of queso dip into each wonton wrapper and spread across the bottom.Follow by spooning some of the meat/beans mixture into each cup and then spooning a teaspoon or so of salsa on top of that. Sprinkle a pinch of the cheese evenly over the top of each cup. Bake for 18-20 minutes until golden brown. Let cool for 5 minutes before removing from muffin tin. Perfect toddler recipe! And quick and easy! What would I do without Pinterest? Ha ha! Hi Kyna! I'm catching up with your posts. Been busy to blog hop lately. This recipe would be an instant hit to my family. We love Mexican inspired dishes. Thank you for sharing and wishing you a great week ahead! I've seen these too, and I think I pinned them but have yet to make them. Yours turned out so good and I'm sure they tasted great. I see a lot of cheesy goodness!! Those look amazing. Perfect for game day! 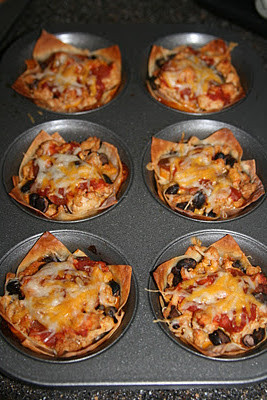 Mexican in a muffin pan. PERFECTION! Yum! I've been wanting to try this recipe- seen it a few times on interest.